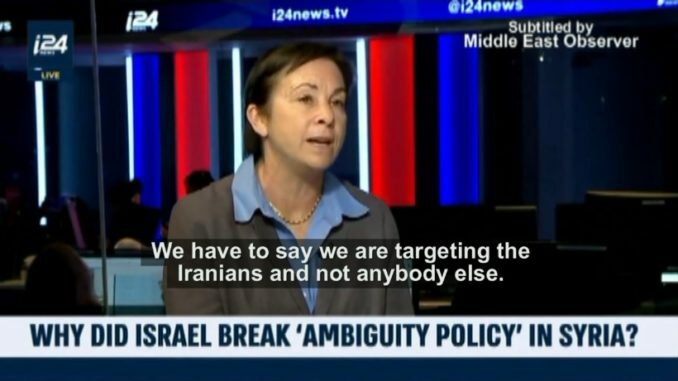 Retired Israeli Army Colonel Miri Eisin has said that Tel Aviv must work to win over “the hearts and minds” by claiming that Israeli military operations in Syria are only against Iran, and not its ally Syria. Eisin made these remarks to the pro-Israeli media outlet i24 News. Eisin was the former Deputy Head of IDF Combat Intelligence, in addition to being an international media adviser to former Israeli prime minister Ehud Olmert. Col. Miri Eisin: I think that what we’re doing right now has a lot to do with the kind of war that goes along with the other war: the war over the hearts and minds. We need to be very clear right now: Israel is not against Syria, Israel is not against the Syrian people, Israel is not against the Russians. Israel is against the Iranian, and the different Iranian sub-groups like Hezbollah, that are situated now in the area of Syria. And we need to say that openly. We need to claim that openly, to do that differentiation. We want the Russians to help the Syrians to get the Iranians out. We have to say we are targeting the Iranians and not anybody else. Anchor: At what point does Israel have to take action? (It) could even involve ground forces…what would it really take to deter Iran? Col. Miri Eisin: I think that there’s a big difference between these air attacks and any kind of ground activity. It isn’t that the Iranian forces are on our borders, there’s a really big difference in that kind of sense. We’ve been acting all over Syria. According to international press, ‘up in Aleppo, down by the sea’. That whole aspect of what has happened, it is all over the place. Anchor: I want to jump back and pick out one word from what you said, ‘timing’, why is timing so important for Israel right now? Col. Miri Eisin: The Syrian war inside Syria. There’s still lots of things going on there, and it’s still going to continue, but the Iranians over the last three years have very gradually built up this whole build up. And if we right now, allow them to just keep on building that up, then you can’t get them out afterwards. It’s kind of that similarity in any other place, where you’re inside a country and then you’re there for years. Israel is very, very against any kind of physical presence of the Iranians on Syrian territory, they’re not there to help the Syrians, they’re not there to help the Syrian people. They’re building these bases to attack Israel, period.